Established early in 2011, Silverstone Auctions is among the most recent entrants into this high-growth sector. Managing director Nick Whale’s 30-year-plus motor industry background, as a main dealer, in motorsports and trading classic cars, is reflected in the catalogues, with classic and modern competition machinery offered alongside classic road cars and latter-day prestige and sports models. Automobilia, particularlymotor-racing ephemera, also features in the company’s regular auctions. Since holding its first auction in June 2011 at Silverstone Circuit, where the company holds exclusive automotive auction rights, sales have expanded to off-site sale fixtures based at key classic shows, including Race Retro and at the NEC. The company’s tenure at Silverstone also takes in July’s high-profile Silverstone Classic race meeting. Why should I sell my classic at Silverstone Car Auctions? While some enthusiasts prefer to buy at auction rather than sell, there’s no doubt that handing over your classic to an auction house significantly reduces the hassle factor of selling a classic. And you don’t have to worry about handling the money or giving away personal details, or make time for long calls about the car or having to be home to show people around your vehicle. Does Silverstone Auctions offer an online valuation? The company assesses the value of all entries based on the information you provide including condition. If Silverstone Auctions estimate meets your expectations, a member of its specialist team will visit you to view the entry, confirm the terms of sale and agree with you the most appropriate auction to feature it. How many sales does Silverstone Auctions have a year? Silverstone Auctions currently has seven classic car sales scheduled for this year. They are held Silverstone race circuit but also off-site with arguably the biggest being at the NEC classic motor show. How much does Silverstone Auctions charge? 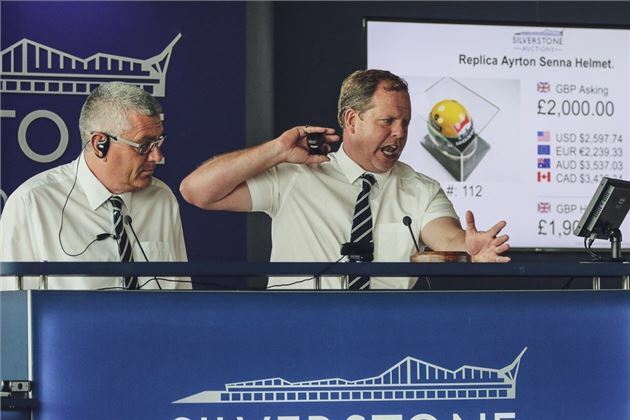 Like the vast majority of auctioneers, Silverstone Auctions Limited charge what is known as a buyer's premium. Its standard buyer's premium charges are 12.5% of hammer price for motor vehicles (cars and motorcycles) and 20% for automobilia/lifestyle items. Buyer's premium is subject to VAT at the prevailing rate on the day of the auction. Is there a seller's fee at Silverstone Auctions? Silverstone Auctions will charge you £250 (plus VAT) per entry and take a 5% cut of the hammer price (plus VAT). Entry fees include an entry in the relevant Auction Catalogue showing your entry with a single full-colour picture and four or five descriptive 'Bullet Points'. Does Silverstone Auctions prepare cars for sale? The item should arrive in a presentable and saleable condition. If your item is deemed by Silverstone Auctions to require further cleaning/presentation you will be notified prior to any work being carried out - but you will be charged for the work by deduction from the net sale proceeds. How long will Silverstone Auctions store a car after the auction? You will need to arrange for the item to be delivered to Silverstone at the appropriate time in readiness for the sale – expect instructions on date/time/directions. For those sellers who require assistance with transportation there is a logistics partner in Kent Vale. Motor Vehicles must be collected from the sale venue by the time specified in the Key Sale Information found in the auction catalogue. Otherwise lots shall be removed to storage at the Buyer's expense in accordance with our Terms and Conditions. A motor vehicle removal fee of £195 plus VAT and storage fees of £10 per day plus VAT will be incurred. Buyers should satisfy themselves that they have collected all relevant spares, documents and keys relating to their lot(s) at time of collection. How long will after the auction will I have to wait for payment? Proceeds of your sold entry will be paid to you within a maximum of 14 working days after the auction date provided we have received the full purchase price from the buyer. We will settle with you the amount of the hammer price less any outstanding charges (including the fees we previously agreed). Online bidding incurrs an additional fee of 1% plus VAT for Motor Vehicles and 3% plus VAT for Automobillia. What cars for sale are in the next Silverstone Auctions Sale? How should I go about selling my 1972 Porsche 911? What advice can you give regarding how best to sell my 1972 barn find Porsche 911 E Lux 2.4 Coupe, RHD, mileage circa 53,000? Up until very recently this sort of thing was gold dust for classic car auctions. You're a bit late for the next Historics on 8 July and you've missed Brightwells tomorrow. But all the good auction houses get far better money for barn finds than you would get by advertising and selling it yourself. There's H&H, Silverstone Auctions, Bonhams. All have actions approximately every couple of months.